Francine's Friends: Let's Go Krogering - Time to Join the Fight on October 5th! Let's Go Krogering - Time to Join the Fight on October 5th! Kroger is donating 3% of sales on Wednesday, October 5th to the American Cancer Society, Cancer Services of Allen County and Francine’s Friends. Again this year 15 area Kroger stores in the region will participate. Additional "Fight Cancer Day" store activities include: Food sampling, Celebrity Baggers, and radio remote at some locations. 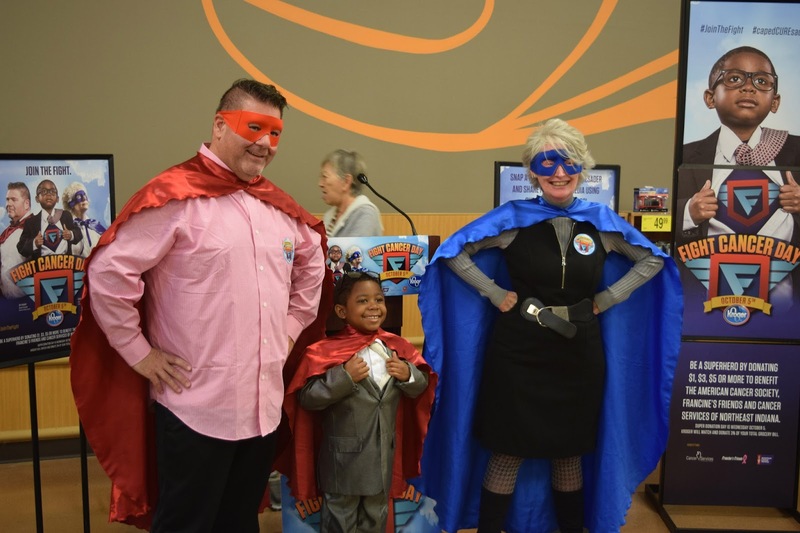 The “Kroger Fight Cancer Day 2016” promotion will be themed to honor local “superheroes” that were nominated by the participating cancer agencies for being a survivor or devoted in the fight against cancer. The three superheroes include: Kendall Williams — Cancer Services, Donna Emley — Francine’s Friends, and Jeff Krudop — American Cancer Society. 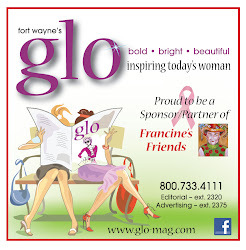 Each has donned a costume & cape on billboards and in-store posters throughout the Fort Wayne area. This year, customers and associates will be offered the opportunity to take photos in a superhero standup that will be in all 15 stores. 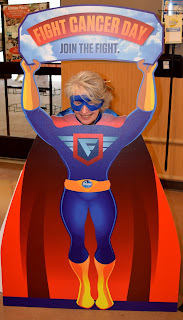 “Donna Emley, a Francine’s Friends Board Member, was a unanimous choice as our Super Hero this year. Donna is not only an important member of our board serving as the chair of our Communications/Marketing Committee where her talents and expertise have branded Francine’s Friends as a highly recognized community asset, but, additionally, Donna is an inspiration to all who know her for her grace under pressure when colon cancer and Stevens-Johnson TENS struck her, one after the other. 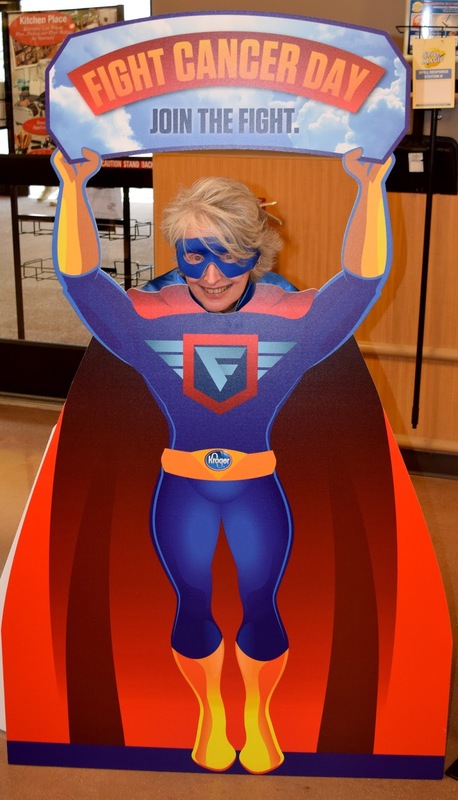 She proved to us that she is not only our hero, but a SUPER Hero as well,” said Francine's Friends board president Sharon Simmons. Over 37 years, the annual Cancer Day event has raised $4,816,773 for local cancer organizations and the company hopes to significantly exceed that amount in 2016. “Kroger Fight Cancer Day 2015” total proceeds were $76,271. Volunteers from ACS, Cancer Services and Francine’s Friends, many of whom are cancer survivors, will be working in stores across the region in support of the event. The "Fight Cancer Day" Superheroes will be making a guest appearance on October 14th at the Francine's Friends 12th Annual "Lunch with Friends" fundraiser at the Allen County Memorial Coliseum. This year's theme is "Celebrating Champions" and Kroger is a sponsor of the annual event.